Tender and juicy with the aromas and blends of cinnamon, clove and fresh tomatoes! A delicious and relatively easy recipe for casserole Greek beef stew, perfect for a Sunday family dinner! ‘Kokkinisto’ translates as ‘reddened’ and is a way of cooking, where the meat is first browned and sealed, to remain juicy and then added to a tomato-based sauce, along with aromatic spices and herbs. Greek beef stew is typically cooked at a relatively low temperature -simmered, not boiled- allowing flavors to mingle. For juicier results, the key is to pick the right kind of meat. For a Greek beef stew, you need to choose large cuts of meat from either the front shoulder or the rear end of beef, which, when cooked for a long time, become fork tender. Serve with a drizzle of extra virgin olive oil, sprinkle with some salty grated cheese and enjoy over a glass of your best red wine! To prepare the reddened Greek beef stew, start by cutting the beef into pieces, approx. 100g/ 3.5 ounces each one. Wash thoroughly the beef and wipe with some paper towel. It is important to dry the meat well, in order to be nicely browned. Heat a large, deep pot to high heat. After the pan is heated, pour in the oil along with the beef. Brown the pieces of beef on one side, without stirring and then brown them on the other side. Try not to overcrowd the bottom of the pan. Browning the beef is very important, when cooking a Greek beef stew, as it helps the meat remain juicy and tender. Use a slotted spoon to remove the pieces of meat from the pot and place them on a plate. To prepare the sauce for the Greek beef stew, add into the pot the chopped onions and turn the heat down. Sauté for 3 minutes, until softened. Stir in the garlic and saute for 1 more minute. Pour in the red wine, turn the heat up and cook for 2 minutes, until it evaporates. Add the chopped tomatoes, the tomato paste (dissolved in a teacup of warm water), the cinnamon stick, the cloves, a pinch of sugar and salt and pepper. As soon as the sauce comes to the boil, add the beef and enough hot water to cover the 2/3 of the meat. When the sauce starts to bubble a lot, turn the heat down and half-cover with the lid (the sauce still has to bubble a little bit). Cook to medium-low heat, for about 1 1/2 hour, until the meat is tender and the sauce thickens, stirring occasionally. If the meat is tender and cooked, but the sauce is not thick enough, remove the pieces of meat with a slotted spoon and boil the sauce alone to high heat, until it thickens. On the other hand, if the sauce becomes thick, before the meat is done, then add some warm water. When done, boil the spaghetti into another pot, according to package instructions; drain and place in the pot, along with the sauce and the meat. Stir with a wooden spoon. 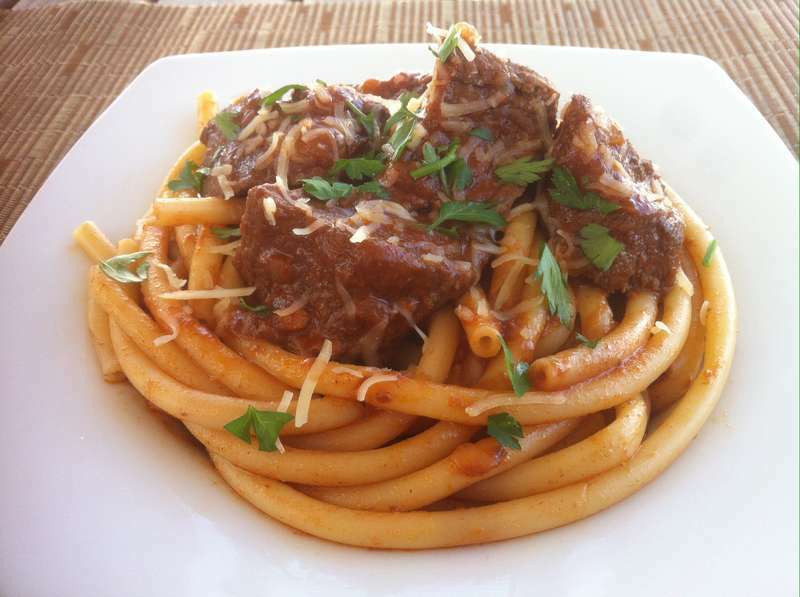 Serve the Greek beef stew with a drizzle of olive oil, sprinkle some grated cheese and enjoy over a glass of red wine. I made this as written and it was absolutely excellent! Just like my father in law’s…maybe even better, per my husband.